I have been so looking forward to this new series, Featuring Studio Spaces. 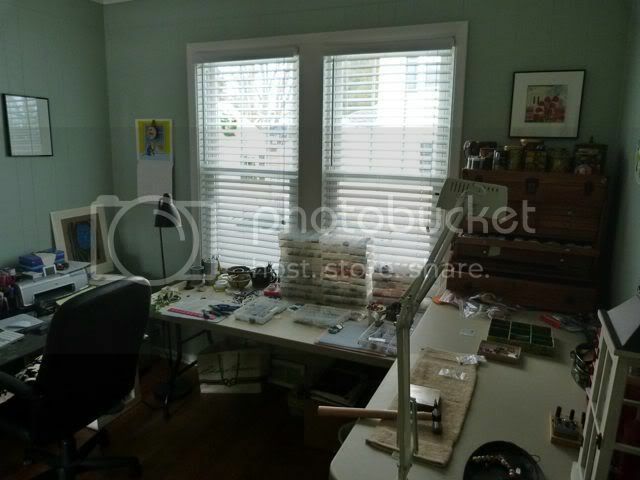 Each week we will feature an artist/crafter and his or her creative space. We'll gather lots of juicy tidbits ranging from inspiration to design and functionality. From time to time, we'll even discuss what's not working (a great time for reader suggestions). As most of you know, Lorelei Eurto is an extremely talented (and frequently published) jewelry artist whose whimsical designs leave her fans in constant amazement. After reading our interview, be sure to head over to Lorelei's blog as well as Lorelei Eurto Jewelry on both Etsy and Big Cartel to check out a few of her goodies. You won't regret. Now, without further ado, let's begin our talk with Lorelei. FSS: Tell us a little about the work you do in the studio. Lorelei: I mostly use my studio to create jewelry, and now that it's located in my office, I also use it online shop, pay bills, and keep up with the business side of the business. Lorelei: I always admire people's creative organization skills when I see pictures on blogs. I love color, interesting knick knacks to look at, walls filled with inspiration- but I'm also a fan of organization, and simplicity. The two rarely go hand in hand. FSS: Name one (or more) things that work especially well for you? Lorelei: I like keeping my tools and sometimes bead projects in little ceramic vessels, dishes, and bowls. They add to the handcrafted look in my studio, are pretty on their own and also act as a functional piece. Lorelei: BEAD STORAGE! This has been an ongoing battle for me. I used to store all beads in plastic bins that I cut the covers off of, and they were spread out on several tables around the room. Then the bins moved to small stacks on a bookshelf. And now, there is not room for that bookshelf so the bins are stacked on the work table. This makes it hard to find what I need. I do have half of my beads in a large 27 drawer vintage printers cabinet, but it's just about full. Another one will have to be acquired in the future! Some day I hope to find the best solution. Lorelei: Functionality is definitely the most important. If I can't find what I need, or have a good understanding of where everything is kept, my mind is completely blank and I get nothing done. I try to keep my studio as clean as I can. FSS: Is there something that you’re constantly having to work on overcoming and what have you done/do you do to rectify this situation? Lorelei: As mentioned above, I am constantly trying to make the storage issue better, easier, more organized. I tried organizing by color but that doesn't ever last long. I am looking into get one of those larger plastic storage containers that has small drawers. 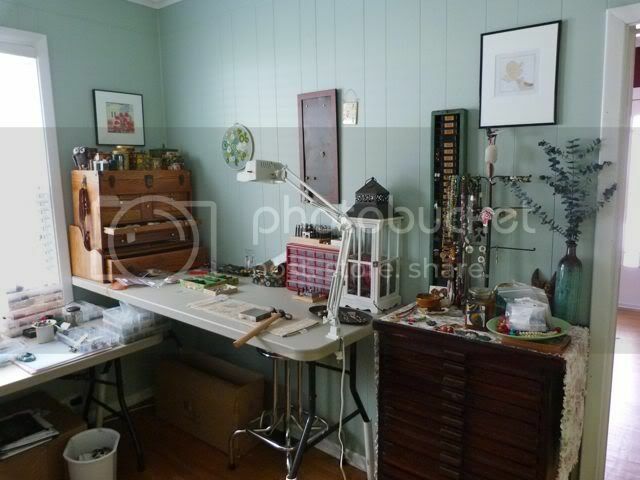 Or possibly something larger, free standing, like one in particular that a scrapbooking company makes, complete with little drawer inserts for beads. Lorelei: I love natural lighting the best because occasionally I will have made jewelry in the evening in artificial lighting, and looked at it the next day, in natural light and been appalled at the color clashing. Lorelei: I love antiques, and two of my favorite things about my studio is the vintage printers cabinet, and a large oak tool box that belonged to my husband's father. I would eventually like to get rid of the plastic folding tables and replace them with large wooden tables, preferably the older and more beat up, the better! It will give me the perfect excuse for antique shopping this Spring! Lorelei: It has definitely gotten bigger and bigger! I started out in the smallest spare room in my three bedroom bungalow, then moved into the larger spare room. The studio was housed here for a good year and a half, in which time, it allowed me to collect more and more things. I recently moved the studio downstairs to the office, a room about 3/4 of the size of the previous room, and have been forced to simplify things yet again. This is all in keeping with the fact that I have major creative ADD and cannot seem to stay still in one space for very long. Lorelei: It has definitely improved my sense of organization, but as an artist- I can pretty much bead anywhere you give me a table and chair. 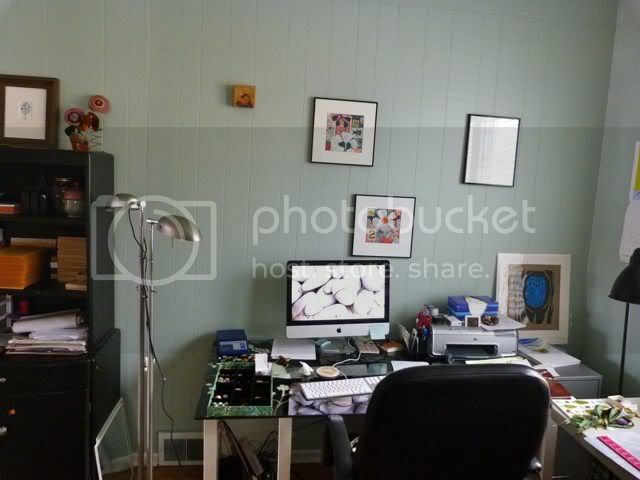 Interested in having your creative space featured? Just click on that little contact button in the sidebar and we'll get your name added to the schedule! Large, small, designer-worthy or simple and functional, we'd love to hear about your space, your inspiration, and yes even your problems! Love peeking at other peoples creative spaces! It so funny how we all have the same issues ( like storage) - I always think that there is some supreme method out there that I haven't figured out yet!Fun feature Lori! Awesome studio feature! 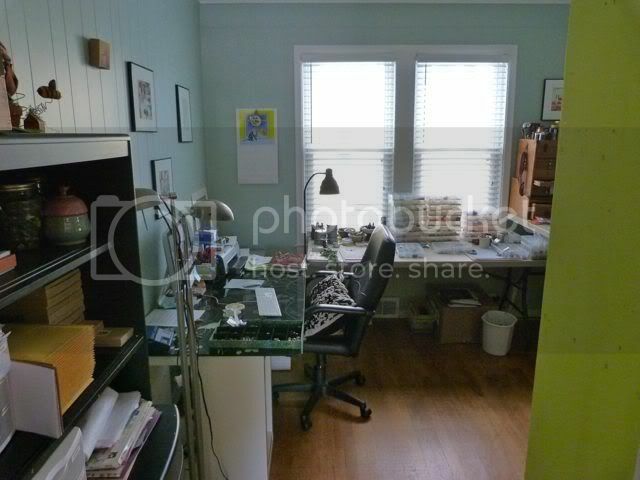 I love Lorelei's space and really want that old Print Makers Cabinet! 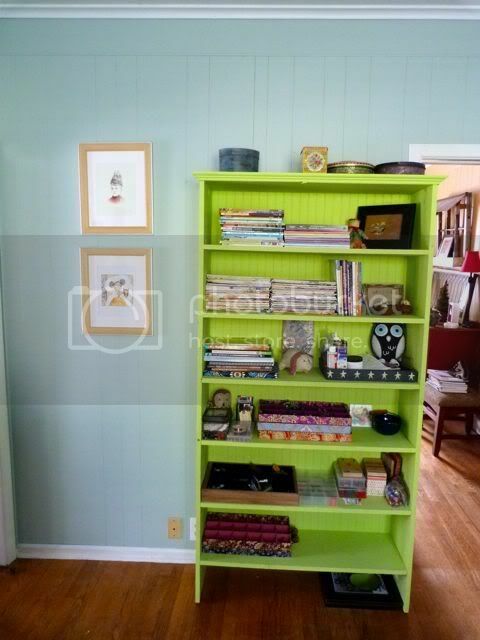 Thanks for this Lori - I love seeing into people's creative spaces too! Love the colours that Lorelei has surrounded herself with. Love the studio feature of Lorelei! It is so cool to see how other people work and what their studios look like. Thanks for doing this Lori, this is fantastic! I'm so excited to be inspired by this feature! I'm glad I'm not alone on the challenges of storage. 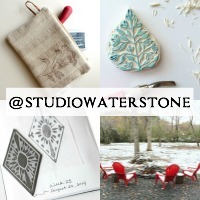 I think we constantly collect - new projects, new supplies, that it is hard to not simply have things pile up. I love the use of non-traditional items to store supplies. The space looks very inviting and conducive to creativity. I'm off to check out the links! Great space and what a great treat to interview fellow artists. It's nice to have a peek into people's creative spaces. What a great post! I love peeking into studios too, it's such an inspiration :) Thanks Lorelei and Lori both! I'm drooling over the printmaker's cabinet, too. Amazing you just moved your space not long ago, so organized!! I'm still working on it, I'd better work harder! Great feature Lori!!! very lovely! i enjoyed reading this!